It's not always blue skies in Dorset. There are mists and rains and all sorts of exciting things which take crispness out of the view. And it's good. Without days like these, I'd feel guilty, as if I spent the whole of my life on holiday. 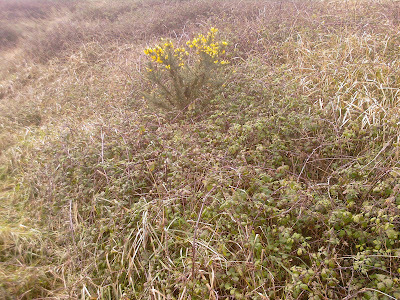 Here's a gorse bush. A jolly little thing springing from the gloom on a you-have-to-peer-if- you are to-see-anything-distinctly kind of day. And here is the internationally famous (well, it is now, isn't it?) Elder Whirl. 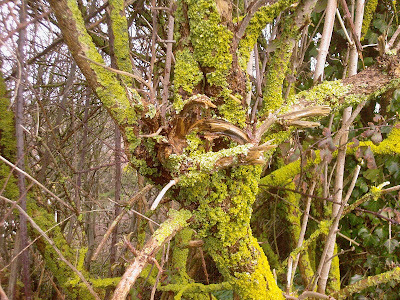 Rain has turned its usually yellow lichen to green. If you break the needle when playing a 78 rpm record - you can use a Blackthorn spike.
. The lower branches of Holly Trees have prickles but the ones too high to be eaten by mammals don't. Blackthorn usually flowers before Hawthorn. I've never tried a Blackthorn Thorn on a 78 rpm record. I don't eat Holly Leaves. 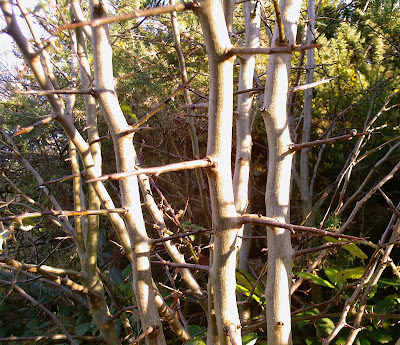 There are buds of some kind swelling on the Hawthorn (May) but nothing is swelling yet on Blackthorn. So, that's back to front for a start. Blackthorn has horrific looking spikes low down and none high up. 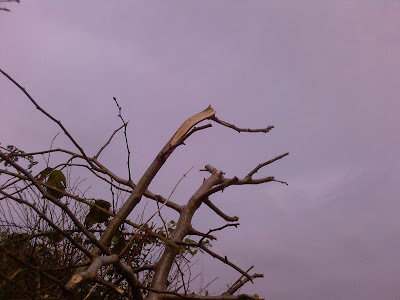 Here is the Blackthorn branch I'll be following. And as a postscript . . . skies in Dorset aren't always blue - but when they are - they are! 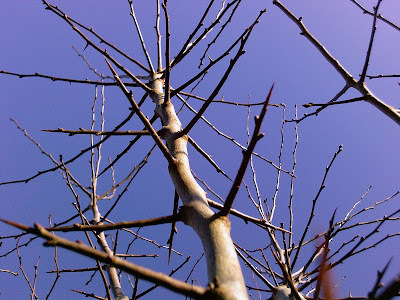 See again how the large thorns peter out, the higher the tree grows? N.B. I've been scratched by brambles and gouged by briars but, despite their forbidding looks - I've never been harmed by a Blackthorn. They simply don't seem to reach out and grab you in the same way. I'm going to have to wade through the snow and take a look at my Holly tree. I've never heard about the prickle distribution rule before. I'll take the binoculars too! Hope I'm right, Easygardener! Better let me know, either way! 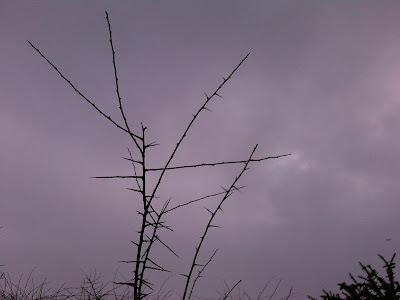 And with the blackthorn thorns - I hadn't known about the thorns fading out as the tree goes higher before . . . it's just something I observed when looking at them for this post. Might be worth checking that too if you come across some bushes. Snow - we had five minutes of very fine but reasonably dense snow this morning (2nd February) and I got very excited - then it stopped. So I'm jealous you have snow to wade through! Wish I'd read this before I waded through the snow in Nonsuch Park today! I'll have a look next time... Don't think I'll be allowed to try out the blackthorn on our precious vinyl 33s (even though beloved hasn't replaced the needle which broke some years ago). p.s. I find the yellow type is really hard to read on apricot background. I don't know about blackthorn thorns, but my dad and I once built a record player out of Meccano. We stuck a paper horn on the end of the arm, transfixed by an ordinary sewing pin. It worked fine for 45s, although I wouldn't vouch for the state of the records long-term! Our next-door neighbour donated the records: 7 Little Girls Sitting in the Backseat, The Bubblecar Song, and I can't remember what else. If you imported giraffes then you wouldn't get prickled. Thank you again, Lucy, for magical photos. That's very interesting about using a Blackthorn for a record needle. I need to tell my husband about that. He collects 78s. Isn't 'Nonsuch' a lovely word! 'Yellow Type on an apricot background' - yes, that would be hard to read - but there shouldn't be any. Either it's something to do with your screen or . . . mine! The background is apricot - but the type is brown. If anyone else is seeing yellow, do let me know and I'll see if I need to change the settings. Catmint - I once saw ostriches in a field beside the railway line between Dorchester and Poole . . . but not giraffes . . . yet! Dominic, Scattered Gardener and Jane-Marie . . .
About using blackthorn thorns on old style records - this was an idea from the days of the second world war . . . when playing music in the 'now' might be more important than worrying about saving your records for the future - which might, or might not, exist. So, although my understanding is that it works - I wouldn't necessarily say it's a good idea. But, Dominic, the mecano record player you made with your dad sounds wonderful!